While growing up, my sister and I kept busy by creating all kinds of art projects. Accustomed to drawing, I chose an art degree and graduated with a Bachelor of Science. I worked at a hospital as a medical illustrator for a few years. When Danny and I were married in 1987, I drew our first Christmas card which started a family tradition. They never took more than a day. I dashed off to the printer and picked them up when they were done. Last year’s card. They were a piece of cake compared to this year’s. What started out as a simple illustration has become a complicated marathon. 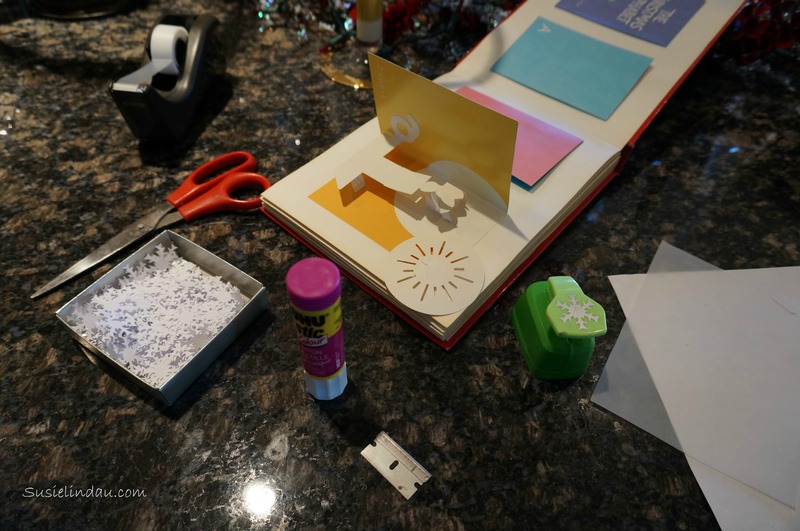 It all started a couple of years ago, when I paged through Robert Sabuda‘s Christmas pop-up books. I stared in wonder at the amazing crafted paper which transformed into 3-d objects before my eyes. The BRILLIANT idea of creating a moving card was born. This year, I searched for inspiration in Sabuda’s books once again. I found two pages that popped up and spun. After five hours of studying and trying to copy the paper mechanism that created spin in the book, I had a breakdown. The stupid thing wouldn’t turn. Deconstructing Sabuda. I finally pulled off the circular part to examine the folds underneath. Instead of wasting more time, I drew the illustration. It only took two hours. I considered printing the card without the pop-up, but something deep down inside screamed, “Don’t give up now! It will be so cool if it works!” I tried to shut the little voice up, strangle it really, but it kept getting louder. I attempted to create the mechanism with heavier card stock. It worked! It was a gift and a curse. After nearly fifty fun-filled hours of printing, cutting, and pasting, the cards are finished. The small quarter turn I worked so hard to create, may not even be noticed when opening up the card. Oh well… I know it’s there. I’m not sure whether it’s determination or stubbornness that won’t let me give up on an idea. Once I visualize a project, I feel compelled to complete it. When I consider the alternative, it feels like defeat. Doesn’t compelled sound similar to compulsive? I looked it up: “Compulsion is the state of being compelled. The irresistible impulse to act, regardless of the irrationality of the motivation. “ Well, there you go. I made it to the finish line exhausted, but happy. Next year I promise to keep it simple and sprint through the project. Yeah. Right. Guess what my family is doing in this year’s Christmas card and I’ll send you one! The more specific the better. If there are more than three winners, I will draw names. Have you ever felt compelled to do something irrational? I’m pretty compulsive when it comes to anything special that I plan. I want to see it through, no matter how difficult it is, like my Halloween parties that I throw for the kids. I bet your cards are divine. Exactly!!! You know how much work it is, but you do it anyway. Hahaha! I never thought of the flower pots!! Thanks for guessing! You are so funny! Thanks for making me stop complaining about all the cards I had to write! They are gorgeous by the way. You are an artist, that’s why you have to do it. So true! Thanks NIa! Can you guess what we are doing in this card? Seems to me that I remember a version of this story from last year’s card, haha. But yes, I totally understand. I try to think that (if I give up) the recipients won’t ever know what I originally intended, so why make myself crazy? But I will know! I hate to put in the work and then give up, and I just WANT, so badly, to make it work the way I envisioned it in my head. And here’s the thing about those Robert Sabuda books: he only has to create one. That is so true! I think I get really excited about the idea, like a little kid, and HAVE to do it! I skimmed the comments and someone after you worked for a while putting together Sabuda books!!!! Can you guess what we’re doing. I think you are right! Can you guess what we are doing? SO glad you put the “Yeah, right…” line at the end of your next year proclamation, Susie. It saved me from having to call you out on that next November/December. Me? I’ll be happy if I meet success with The Hubster’s family tradition fudge squares on the first round. Dang fudge-like topping. Dang instructions from departed MIL to boil seven minutes with no indication of temp. Dang sugar crystallization. In years past, I’ve chucked up to six batches before I got that shiny clear surface. Wow! Those sound like challenging brownies! I bet you did it on the first try this year! I think I get determined after coming up with an idea. I doubt many will realize that 50 hours went into these cards this year. You have to guess Gloria! 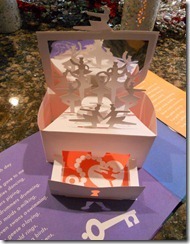 PS – I’ve worked on a Sabuda pop up book (Brava Strega Nona). A lot of glue. Crazy stuff! That is perseverance! Good for you! That is so cool! Did they have an assembly line? Oh yes, Dozens of workers just gluing little flaps and things! I have no idea what the Lindau clan is up to in your holiday card, but as long as they do it as a family, I bet it’ll rock! Love the sarcasm. Great to see you MJ! Can you guess what we are doing? I’m still wowed by your cards from last year! Gorgeous!!! Out of compulsion comes art. Thanks! They are unique anyway! Hahaha! Guess what we are doing and win one! It’s getting tiresome…to say you have outdone yourself. But ya have . . again. At this rate, you might as well start on next year’s Christmas card, like now. Seriously though, it’s a testament to your stick-to-itiveness that you even ventured into this project and then STAYED there. You’re always inspiring. The guess would be that the gang is playing football in the front yard whilst you coach ’em up. The ‘Buffs need to hire you, tell you what. Thanks Caymen! I’m just glad they’re done. 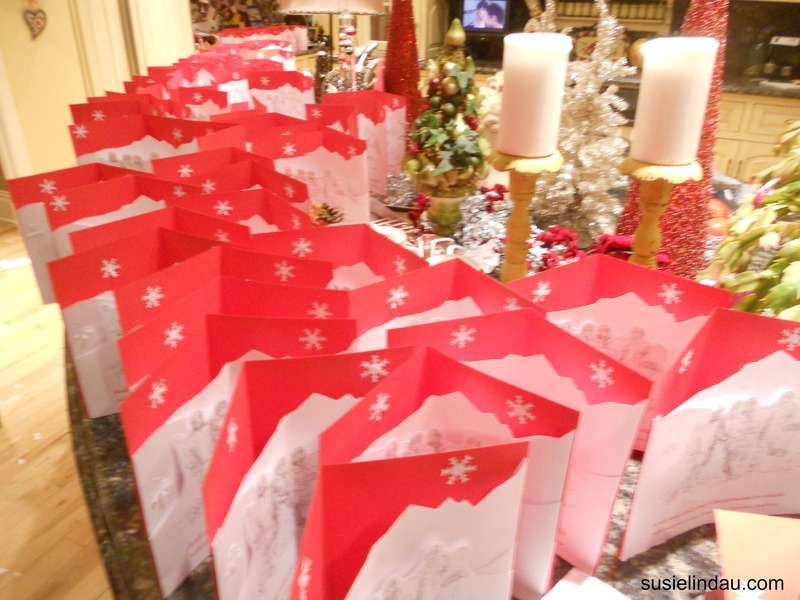 Whew…one week left and I have lots of shopping to do!! The Buffs definitely need something…. I love making my own greeting cards. Thanks so much for sharing your moving card tips here. I have been into sliders and pop-outs for several years now. Each card and each wreath I make is unique and specially designed with the recipient interest in mind. All my cards have been mailed and I completed my last contract for the year yesterday. Woo hoo! Now I amready to deck my halls. I’ve mailed them all so there are none to see now but I’ll be making more in the future and I will get hubby to take photos. Miss Susie, you are cray-cray! And my idol. I’m not even doing cards this year, since I’m barely able to write my name lately. I bet your family is dancing…with joy, because their mom/wife is so creative. How in the heck are you??? Thanks so much and for the wild guess! Thank you. That’s great! It never occurred to me to look at YouTube videos. I got some great ideas from Timethief! Check these out! “How does he do it?” Um, he probably has a staff for god sakes! You are amazing….seriously badass amazing! My guess would be something regarding your amazing vacation. Perhaps a pop up airplane (that probably really flies) going over the beautiful cities you visited. Thanks so much Lisa! Great guess! One of the commenters worked making the Sabuda books. She said It took a lot of glue! I am planning to start a lot earlier next year. Hopefully…. The card sounds very interesting and wonderful! Hahaha! A relative just said, “Interesting.” I don’t think he understood the meaning of dancing on 2013’s grave.